I became obsessed with drinking water. I noticed after doing so my skin looked amazing. I had more energy. I also lost a little weight. The best benefit was I was hydrated. I really loved the taste of this water. I figured it would be nice to share it. You will need to cut the fruit and then place them in the water. I stir the water without ice. Then I put in the mint. I stir in ice and I let this sit in the refrigerator overnight. 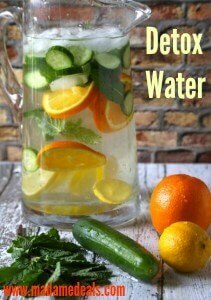 This is an amazing detox water recipe. 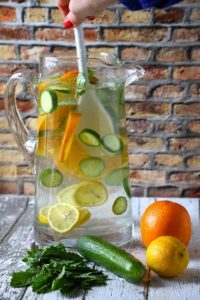 Another one of my favorite water recipe is this one Make cucumber water detox. We believe in losing weight with water.